I am in Croatia, preparing our Villas for the summer season. 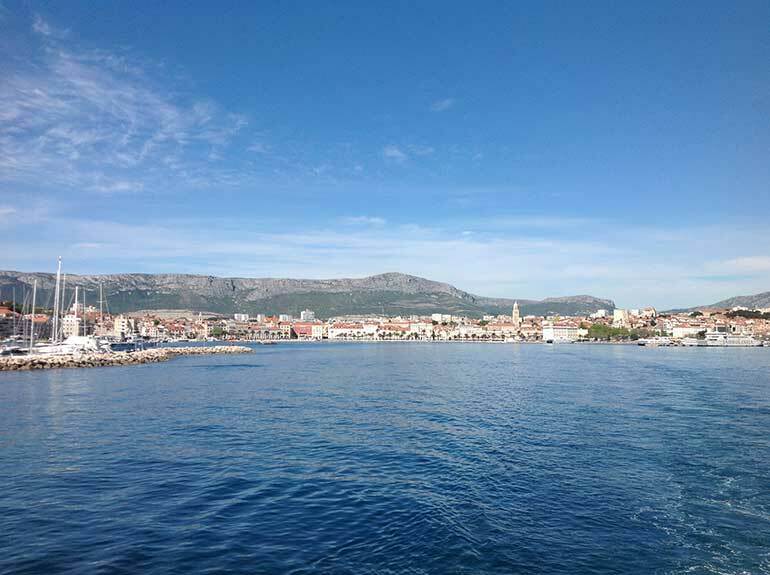 Right now I am sitting on the ferry boat, leaving Dubrovnik and on my way to Villa Drvenik. Sitting on a small ferry boat , leaving the mainland in slow motion gives you a holyday feeling, job or not, it is divine. Travelling is a big part of my life and I never get uncomfortable, I still enjoy it, no matter how much I do it. Driving my own car is of course a lot easier than to fly, but any kind of changing countries or continents fills my heart with happiness. This is a beautiful time of the year in Europa. 20 degrees and blue sky, very little tourists yet and the sea is calm and the most beautiful deep blue colour. It will take me 2 hours to arrive on Drvenik Mali. Mali means small and it is indeed a small island. Out of season you have to bring all your goods from the mainland because restaurants and the bakery will only open in about 2 month time. So if you forget something, that’s really bad luck for you! As a result of that I always buy too much and even knowing this, the worry of missing something is bigger than the smart brain. To be honest I am always excited moving to the island. For me it is a very special place. No cars, not a single noise, you are almost going into a forgotten world. For example we do collect water during the winter in so called Zystenas and during summer the water will be filled up, as we buy the water from big ships, delivering only every 4 weeks. Sometimes my internet connection is breaking down and the rest of the world seems to be far away. Nothing is easy because you have to plan carefully but the spirit of freedom is breathtaking. It is not really like Robinson Crusoe but living on a small island is definitely another feeling. It is a lovely experience and I wanted to share it with you. Maybe the pictures will give you a better impression.